Rather than just posting a load of images from my weddings, going forward I have decided to post one a week with a little bit of an explanation as to what went into the shot in terms of thought-process and technique. A lot of the time, what to many just looks like a simple photo has a lot of elements to it that are interesting to highlight and chat through. One of the main things that I aim to do, which I feel differentiates my work from many other wedding photographers out there, is to be relatively deliberate about when I press the shutter rather than just shooting anything that moves. The elements of a good shot for me include emotion, lighting and composition and so I spend time seeking these out and reacting accordingly. 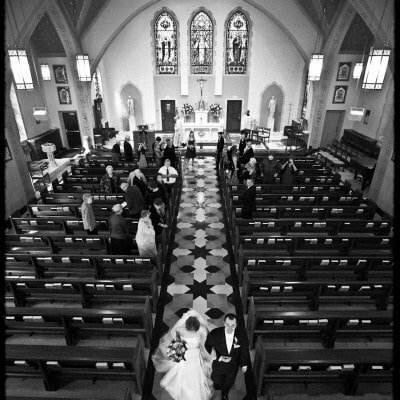 All three elements come together in the photo above, which was taken at a wedding I shot last weekend in Cincinnati, OH. I talk a lot about being unobtrusive with my approach, which means I like to let people just be themselves and observe what happens. For true emotion to come through, I really do shy away from staging shots or posing my subjects as, for me, that approach tends to mean that all weddings end up looking pretty much the same. In this case, the guys had just arrived at the church and were chatting away in the parking lot before going in. 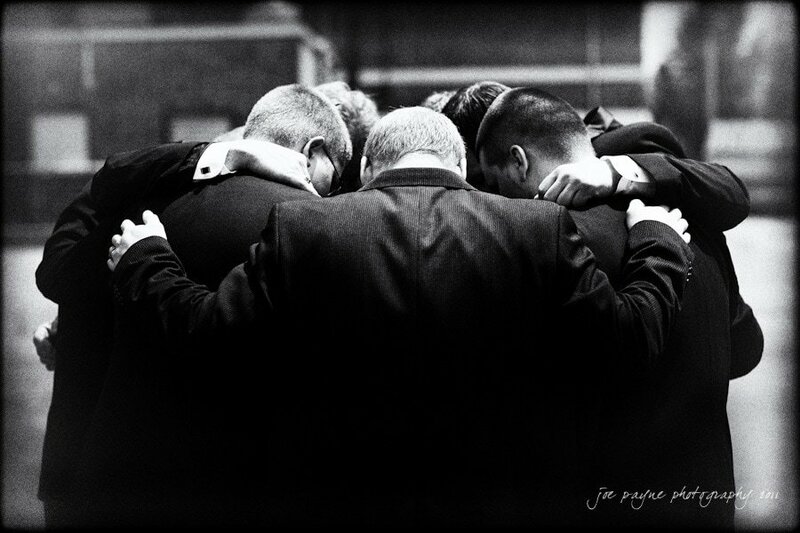 There was the usual fun banter and chit-chat going on when suddenly the guys got into a huddle to say a quick prayer or share a private word (I don’t know what was actually said as I couldn’t hear!). I remained detached from the group and focused on observing and documenting the moment. I wasn’t sure how long they would be in the huddle for, so I had to react pretty quickly to frame the shot in such a way that the composition worked well and the distractions in the background were minimised (there were cars parked just to the left and other people milling about right next to the huddle). I selected a wide aperture along with a longer focal length to minimise the depth of field and blur everything aside from the subjects. I chose to process this image in black and white to accentuate the texture, lighting and shadows, which I feel complement the emotion of the moment. Another advantage of black and white in this instance is that it focuses the attention on the subjects and takes away some of the distractions from the background that were visible in colour. From a personal standpoint, I also like the timeless feel of black and white; this photo could have been taken last week or 50 years ago. You really can’t tell. The end result is quite a simple shot in terms of content, but the sheer emotion of the unstaged moment along with the lighting, leading lines of the arms and the symmetrical composition make for a very strong image for me. I hope it is one the bride and groom will look back on and enjoy for years to come.